A photo taken in the Red River Delta near Hanoi by jonsanwell on Instagram. Photo taken in front of Saigon's landmark of Notre-Dame Basilica by vodongphong on Instagram. Photo taken on the street of Hanoi by thaicq on Instagram. Photo taken by Tran Minh Hoang, posted on vietnamstreetphoto on Instagram. Photo taken at a ceremony at Phuc Khanh Temple in Hanoi by _olympus.mons_ on Instagram. Photo taken in District 4, Ho Chi Minh City by saigonpix on Instagram. Photo taken by Lam Minh Khue in Hanoi, posted by s.vietnam on Instagram. Inside a barber shop in Hue by cold.foto on Instagram. A Top Shot photo selected by natgeoyourshot on Instagram. 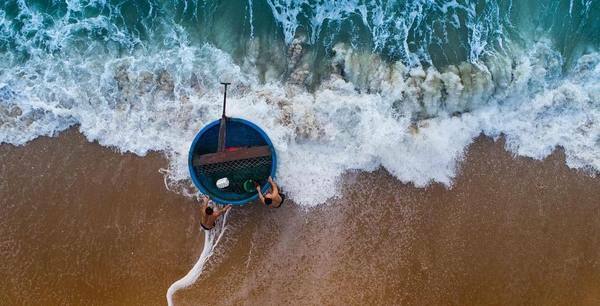 "Fishermen sail the coracle on the beach of Binh Thuan, a coastal central province of Vietnam," the caption reads. "The coracle is a small, round, lightweight and flexible boat. Fishermen who navigate the coracle must have excellent health and special skills to keep the boat balanced on high waves and precise operation." Photo taken by Tran Tuan Viet @trantuanvietsui.